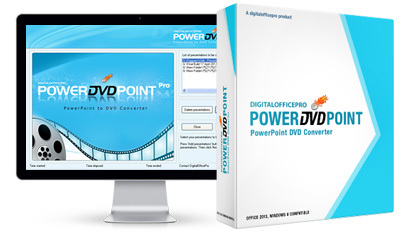 PowerDVDPoint Pro is a powerful conversion tool that allows converting PowerPoint presentations to DVD and various other video formats. The key feature of this multi program allows you to insert your own video narration on slides. PowerDVDPoint Pro converter converts this clippings and it plays seamlessly on the converted presentations. PowerDVDPoint is now FREEWARE !!! Supports batch conversion to save your time. Burn your PPT presentations (*.pptx, *.ppsx, *.ppt and *.pps) to DVD and video formats like avi, mpg, mp4, 3g2, 3gp to support portable devices like iPod, iPhone, PSP, Pocket PC, etc. Unlike sharing a presentation as a PowerPoint file(easily editable), sharing a presentation after converting it to Video/DVD format will protect your presentation from being modified or edited. A user friendly wizard like interface combines aesthetics with striking functionality for an easy, intuitive user experience bundled with powerful optimization capabilities. Preserves PowerPoint special effects like animations, sounds, slide transitions and video clips. To be precise, output works ditto Microsoft PowerPoint. PowerDVDPoint supports batch conversion which comes handy when you have large number of presentations to be converted to DVD or other Video formats. By converting your PowerPoint presentation to DVD, you are creating an engaging digital signage content in the familiar PowerPoint environment. Need not hire costly content designers for the same.